In 2002 we moved from our woodland acres in east central Minnesota to this ridge-top farm in the southern Ozarks. One of the first things we learned was that our neighbor across the road raised cattle. Lots of cattle. In addition to his own property, he rented six hundred acres of pasture from another neighbor down the road whose acreage abuts ours in back. He and the two cowboys who worked for him frequently rode down the dirt-track township road that fronts our farm, either on horseback or driving a battered farm truck. “No,” I told him, “but thank you. I was just wondering what this is.” Meaning, is this an Arkansas Chocolate Tarantula? The two cowboys exchanged a knowing look (“Really ignorant Northern woman,” was what it said). “It’s a spaahder” (it’s a spider), he told me. After that I became a continuing source of amusement for them, or so it seemed. Whenever I did something stupid, they were there. Like the time I chased our errant, runaway beagle down the driveway and out into the road, wearing my Sylvester and Tweety Bird jammies, just as the battered pickup crested the hill. Or the hot summer’s day I was kicked back, eyes closed, luxuriously cooling off in the llamas’ wading pool, and glanced up to spy their horses trotting up our driveway (they’d come to borrow a dose of Banamine for a sick horse). In December of 2003 I bought my first registered Miniature Cheviot sheep, Baasha, and a ram lamb named Abram. Abram was ultrafriendly, and he quickly became a pet. A bad idea, I knew, but he was so darned cute. Background: I learned about woollies by helping a Minnesota friend with her small flock of spotted Jacob sheep. Her ram was a magnificent creature with impeccable breeding, but she got him very cheaply because he was pretty darned ornery. It wasn’t his fault; he’d been purchased as a lamb by a family whose teenage sons played with him by pushing on his forehead so that he’d push back. Rams are wired to, well, ram, so messing with their foreheads is verboten. When he grew up and began ramming people in earnest, the family returned him to his breeder, who subsequently sold him to my friend. Not long after his arrival, I was ambushed, knocked down, and thoroughly worked over by this ram. My friend showed me how to subdue him by grabbing a front leg, moving quickly to his side, and flopping him down on the ground. As his first autumn breeding season approached, Abram entered rut. By then I’d added several more ewes, and I’m sure he was anxious to impress them. As I walked among the sheep (in the pasture bordering the township road, of course), he would flip into ram mode and begin backing up to charge. Then he’d race toward me, hopping to a stop just before making contact. I didn’t like that, so I took my friend’s approach and tried to flip him to the ground. 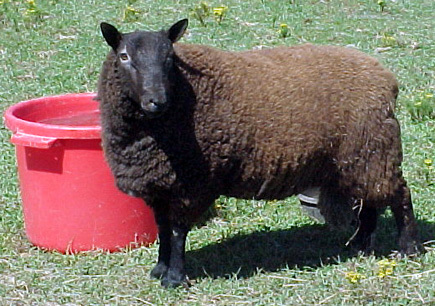 However, Miniature Cheviots are built differently from Jacob sheep. Jacobs have longish legs under fairly slim bodies; Abram was long, broad, and set on short, wide-set legs, so I couldn’t quickly roll him over in the conventional manner. I tried a different approach and grabbed both front legs; then by lifting his fore end and throwing my body against his shoulder, I could lay him down without hurting him. Exactly twice. Then he discovered that if he hopped on his hind legs, I couldn’t get beside him to shoulder him down. One morning after Abram discovered the hopping trick, we were waltzing across the field when a familiar battered truck crested the hill. It slammed to a halt, and its grinning occupants watched us with open delight. I later learned (through a mutual acquaintance who was there) that they were on their way to a café in Hardy, where they entertained the coffee-drinkers’ table with loud guffaws and a vivid description of the crazy lady up the ridge who dances with sheep. Not long after that our neighbor downsized his cattle operation, and the cowboys stopped driving by. I still do stupid things, but without an audience, and in a perverse way I sort of miss them.